You must work in your Learning Module for at least five hours between placement assessments. There's a 48 hour "cooling off" period after each placement assessment. You can work in your Learning Module during this time, but you can't start a new placement assessment until the cooling off period has ended. You can find the current information about your reassessment eligibility in the sidebar of your ALEKS homepage, in the gray "Placement Assessment" region below the blue "Up Next:" region of the sidebar. If a lock icon is shown, at least one of the conditions for reassessment hasn't been met yet. If you're still cooling off from your most recent placement assessment, ALEKS will show you when the cooling off period will end. If you haven't worked in your Learning Module for at least five hours, ALEKS will show you how much more time you need to spend practicing in your Module before you can reassess. When you're eligible to reassess, the lock icon will be replaced with a START button. Review Set the Stage for Success and the ALEKS Assessment Commandments before starting your new assessment. When conditions are perfect and you're ready to strut your stuff, click START and show us what you've learned! Your ALEKS PPL license is valid for one year, but your Learning Module is accessible only for six months from the time you first enter your Learning Module. 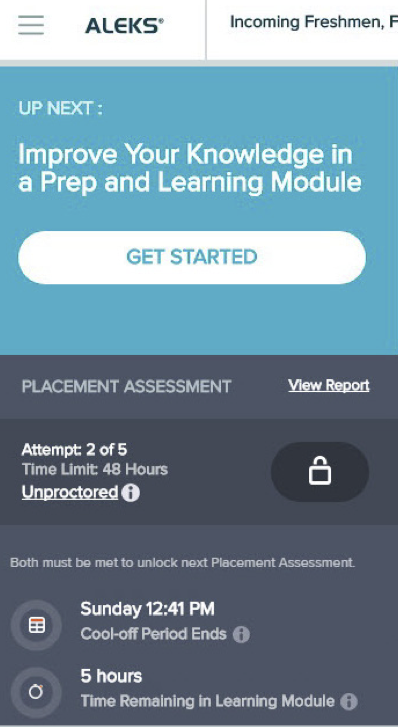 Since you need to work in your Learning Module for at least five hours between assessments, if you let your Module expire without investing at least five hours work after your most recent placement assessment, you won't be able to reassess even if your license is still valid. If your license has expired, or you can't reassess because your Learning Module has expired and your next assessment is still locked, you can apply for a new license, but it's best to make full use of your original ALEKS PPL license.